It’s time for the new Weekly Feature for Hasseman Marketing called the Perfect Promo! Each week we will showcase another cool product within the promotional industry that you might not have already seen…and explain why we think it’s cool! This week Jeff Wickerham highlights a product that he saw at the recent PPAI Expo in Las Vegas. Watch the latest Perfect Promo here! 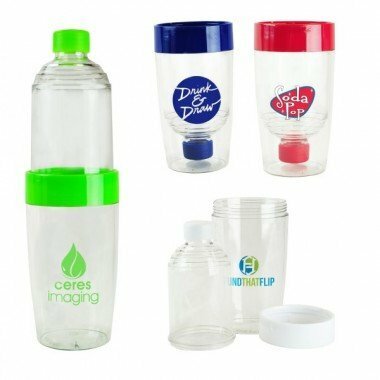 The Flip Bottle is a BPA free 32 oz Water Bottle that starts as a 14 oz double wall tumbler, but converts to the large water bottle! Different and fun. This could be a great item for events, health and wellness campaigns…and more. If you want more information on the Flip Bottle, you can check it out here. As always, if you want to discuss how this “perfect promo” might work in your next campaign, please contact us at Hasseman Marketing! We would love to help you bring Marketing Joy to your next campaign!